Can You Sue Because a New Road is Too Noisy? — Sammartino Law Group, P.L.L.C. Can You Sue Because a New Road is Too Noisy? The current state of construction along West Orange Grove Road. Residents adjoining the expansion project along West Orange Grove Road are unhappy with Pima County’s decision not to construct a noise abatement wall between the newly-expanded roadway and their properties. Do they have a remedy at law, or must these owners wait to exact revenge during the next election cycle? 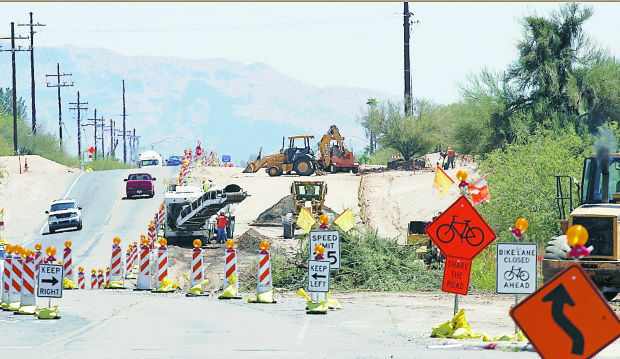 Pima County an almost-absolute right to determine whether it constructs a noise wall along a newly-expanded road. Road projects would never get done if every member of the public had to agree on the manner of construction. Political pressure is the most effective, and often the only possible, lever to force a governing body to modify its construction plans. Faced with that seemingly harsh reality, property owners must content themselves with receiving monetary compensation for damages suffered from increased roadway noise.. Numerous methods of variable efficacy exist to recover damages from public works projects. The easiest way to recover damages from a road project is to recover them in an eminent domain (also known as a condemnation) proceeding. Increased noise and a concomitant diminution in property values is usually an issue in direct condemnation cases when the condemning agency takes property to construct a wider road and leaves a property owner with a remainder piece of property. The remainder is closer to a wider, busier road after the taking, and the property owner can make a claim for severance damages, which is the legal term for the damages sustained from the diminution in value that the remainder sustains as a result of the taking. Evidence showing severance damage from increased noise is admissible in Arizona. This clear statement of Arizona law is why it is better to have a small portion of your property taken for a public works project happening adjacent to your property than none at all. Direct condemnation proceedings follow very established procedures for guaranteeing just compensation to the property owner. A successful legal course to claim damages arising from a noisy new highway is less easy to chart absent a direct, physical invasion of property. However, the Arizona Constitution prohibits the government from taking or damaging private property without just compensation. A direct physical invasion is not a prerequisite for recovery in an inverse condemnation case if the property owner can show that the government action substantially interferes with a protected interest in property. The Supreme Courts of Louisiana and Oregon have come close to allowing such damages. The residents along Orange Grove might have a legal remedy under the Arizona Constitution. Don’t look for a lawyer with a perfect win-loss record to take the case: I once heard a very successful land-use lawyer from Phoenix say, “If you are not losing any cases, you are not taking any difficult ones.” This case would certainly be an uphill battle, but it would be an interesting one to test the boundaries of what “damage” a property owner must suffer from progressive public improvements.